A decline in family farms, a lack of jobs and depleted economic opportunities are causing heavy populations losses in the rural South, Larry Copeland reported for USA Today. "The USA's population history is most often a story of growth -- of people moving to ever-growing metropolises and the challenges of accommodating them," Copeland writes from Sumpter County, Ala. "But vast sections of the nation are seeing heavy, sustained population losses, a reflection of the decline of family farming and the lack of rural jobs and economic opportunities. 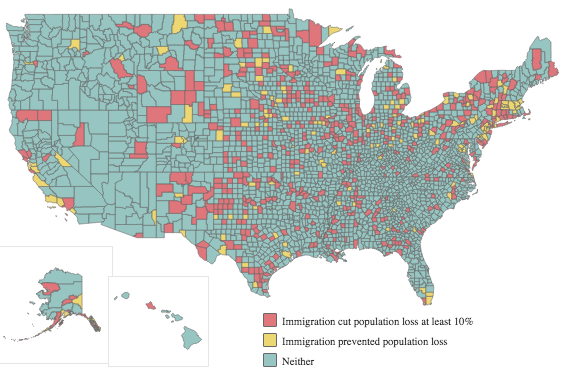 Some of the most drastic population decreases in the 20th Century occurred in a wide swath of rural counties in the Great Plains, from the Canadian border to Texas. Sumpter and most of the Southeast's other shrinking counties are in the so-called Black Belt, where vestiges of the Old South--de facto school segregation, poor race relations and entrenched poverty--are most prevalent. Rural towns in the Carolinas and Georgia, and especially in Alabama, Louisiana, Mississippi and Arkansas, are hollowing out." The Black Belt, named for its rich and dark topsoil that attracted plantation owners to a swath of land running from Mississippi to Georgia. Today, it can refer more broadly to a rough crescent of hundreds of counties with significant African-American population from Virginia to Texas. It is sometimes defined even more broadly, to include northern Florida and the Mississipi Delta as far north as the southern tip of Illinois. It is sometimes defined economically, as in this map from the University of Georgia's Initiative on Poverty and the Economy. For its other maps, click here. TheBlack Belt's population loss and that of the Great Plains stems largely from out-migration of young people. Land-grant universities in Black Belt states are seeking solutions to the region's problems. They and some congressional representatives and community leaders want a federal Black Belt Commission, similar to the Appalachian Regional Commission. "There's a growing understanding that it takes more than civil rights laws to make the needed changes," says Terrance Winemiller, an associate professor of anthropology and geography at Auburn University-Montgomery and lecturer on the Black Belt. "It takes preparation and a regional involvement. In fact, I would say even a national involvement." Read Copeland's full story here. "The Yuma Regional Medical Center (YRMC) has been 'beaming up' doctors from around the state for the past few years," Jennifer Lovell writes for the Yuma Sun. 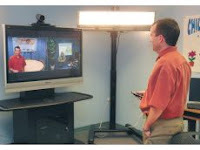 "For patients who can't afford to visit specialists outside the area, YRMC's partnership with the Arizona Telemedicine Program connects patients through new technology." The Arizona Telemedicine Program and YRMC received a favorable review last month from Dr. Ronald Wenstenin, director of the program at the University of Arizona Health Sciences Center. "Telemedicine is the practice of medicine at a distance using video imaging and telecommunications technologies," Weinstein wrote in an e-mail. "The Arizona Telemedicine Program is a large statewide program. It provides the telecommunications infrastructure for telemedicine, telemedicine training and many telemedicine services over its network." YRMC applications administrator Mike Sisson (in Yuma Sun photo) works with telemedicine for children's services. He said that he works mostly with children who are in wheelchairs and whose families cannot afford to drive outside Yuma to visit a physician or specialists. "Sometime it is the only way (for rural patients) to see the doctor." "Gregory Warda specializes in neonatology and works in the intensive care unit with newborn babies at YRMC, "Lovell writes. "This is a great solution," Warda said. "We can see the nurses and doctors (through the screen). It's jsut lie hem were right here, and I can ask the doctor questions instead of writing a letter." Weinstein would like YRMC to be an example to other hospitals who would like to implement the program, which could benefit rural patients nationwide. Rural drivers may find it more difficult to find gasoline in their community, Marci Royal Huggins writes for The Fayetteville Observer. Several gas outlets in North Carolina's Cape Fear region have stopped selling fuel, and others are considering it, because of fees charged by credit card companies. "Somebody's got to do something," station owner Tony Coats said. "It hurts everybody. It puts the little man out of business." "While gasoline may have doubled in the past year, the stations that sell it to you are operating on an even slimmer profit margin, especially when customers use credit cards to pay for their purchases, reports show," Peter Williams writes for the Richmond County Daily Journal. "Stations that might have made a profit of 10 cents per gallon on a cash sale a few years ago now find themselves actually losing money selling gas to customers who use a credit card." Companies are charged between 2 and 3 percent per transaction. Many customers assume that $4 per gallon gas results in high profits for gas stations. "People don't understand," station owner Boddy Wiggs Jr. to,d Williams. "If I use credit cards at the self-service pump, I lose money. I pay $300 to $600 a week in credit-card fees. I know a couple of friends who have stopped selling gas for that reason." Some gas outlets are convenience stores that may survive food and drink purchases, but many of their customers are cash-starved, which makes them more likely to pay with credit cards at the pump and not enter the store. "The problem with higher gas prices is it leaves less discretionary spending, so maybe when you get gas you can't afford to go inside and bu the other items that you would have before," said Gene McLaurin, a spokesman for Swink-Quality Oil and Gas in Rockingham, N.C. "You may not be buying that Coke and the pack of crackers. I've talked with other oil distributors who said this is the worst market conditions they've ever seen. If you go drive around the countryside you will see old abandoned gas stations, and I think you're going to see another round of that, but it will be convenience stores in a lot of rural areas." One alternative to closing is to cease taking credit cards. Rural stations cannot always benefit from discounted loads because the cannot fulfill a full 8,000-gallon tanker load. "I'm honestly afraid we're going to see another round of small, independent stations going out of business," McLaurin said. A study conducted by a University of Oklahoma researcher indicates that community involvement and the school's commitment to student excellence are determining factors in whether a rural school is high- or low-achieving. Perri Applegate, recently investigated the differences between a high-achieving and low-achieving rural high school. Her study focused on high-poverty schools in which at least 51 percent of the population is eligible for free or reduced lunch, a press release from EurekAlert said. "Applegate compared the scores on Oklahoma's Academic Performance index, the state's annual school report of 367 Oklahoma high schools ranging from large, urban to small, rural schools. She found no significant difference in achievement of rural schools and those in other settings." Click here to read the entire press release. "In small-town America, the school and the community are dependent upon each other for success," Applegate said. Schools tend to be the focal point of rural communities and serve as a gathering place and, at times, social services. Students have access to increased resources and support outside of their schools in urban areas. "Rural schools in the study listed the same factors as impacting student achievement; poverty, parental support, community, extracurricular activities and a caring school culture," Applegate said. "The difference between a high- or low-achieving rural school was how they--both the school and the community--met those challenges." Educators at high-achieving schools embraced their role of being a rural teacher and typically had multiple responsibilities and were creative with necessary resources. These schools had shared, supportive leadership, did not believe students will fail because they attend rural schools, and authorized stakeholders to take leadership roles. High-achieving schools also reinforced the school-community bond and benefited from parents and community members supporting teachers. Low-achieving schools felt being a rural school deterred student success, and school administration and the community were burdened by the lack of resources. This attitude mirrored the educational approach of the school and reduced students' likelihood to attend college. "According to Applegate, these findings have serious implications beyond education," the EurekAlert press release said. "Research shows that schools can save communities. The success of one can determine the success or failure of the other." "We can't assume that student success in all schools, large and small, is impacted by the same issues," Applegate said. "So the question becomes how do we help schools in their environment become successful?" To read Applegate's report, click here. One of the nation's top two ethanol producers, South-Dakota-based VeraSun Energy, announced Wednesday it will delay startup of its new 110 million-gallon-per year ethanol plant in Hankinson, N.D., Perter Shinn reports for Brownfield. The Hankinson biorefinery, which joins a pair of 110-million-gallon-a-year operations in Welcome, Minn. and Hartley, Iowa, becomes the third facility VeraSun to delay startup operations this month. VeraSun spokesperson Mike Lochrem tells Brownfield that 'market conditions' and the 'steep discount' at which ethanol sells compared to gasoline resulted in the decision to keep the plants inactive but are not the only reasons. "Corn prices are another part of that dynamic and certainly we've seen rising corn prices," Lockrem said. "But I think the real driver for us is where ethanol is selling on the marketplace." Shinn writes, "According to Lockrem, ethanol remains undervalued compared to gasoline because of the widespread market perception of ethanol over-production. He added the decision to keep 330 million gallons worth of ethanol production a year off-line should help change that perception." All three operations will be capable of producing ethanol very quickly, Lochrem said. "We're going to market on a day-to-day basis," he explained. "And when those conditions become more favorable we're going to make decisions to get these plants into production as soon as possible." For the VeraSun press release click here. U.S. crop losses are estimated at $8 billion for weather-related damage, and Iowa accounts for approximately half the losses, according to the American Farm Bureau Federation. "There are notable problems in at least a dozen other states ranging from the excessive wetness and flooding in Illinois to drought in California," the AFBF said in a press release. "Wet weather and flooding create issues, as farmers are unable to plant their crops," Terry Francl, AFBF senior economist, said. Expected Iowa corn yields have been reduced 16 percent for this year, and 1.5 million to 2 million acres of corn and soybeans that Iowa farmers intended to plan this spring will likely remain uncultivated, Francl said. According to the press release, "Other states taking a hit from excessive wetness and flooding are: Illinois, $1.3 billion; Missouri, $900 million; Indiana, $500 million; Nebraska, $500 million; and an additional $1 billion in remaining wet states. Some areas are experiencing the opposite problem. Drought is taking a toll on several western states and a few states in the southeast." Farm Bureau warns that the figures are preliminary estimates that could increase or decrease depending on growing conditions the remainder of the season. Flooding concerns increased as heavy rains fell overnight Tuesday and Wednesday in some parts of northwest Missouri, Julie Harker writes for Brownfield, an agriculture news service based in Missouri. Many West Quincy, Missouri residents have voluntarily evacuated as the Fabrius River, which flows into the Mississippi River, swells. "Efforts have redoubled to protect levees in the Sny Island and Pleasant Hill drainage districts of Illinois that have not lost any levees yet," Harker writes. "Blake Roderick, head of the Pike and Scott County Farm Bureau offices in Illinois, says a third crest of the Mississippi is coming that will be larger than the previous two." Approximately 600 National Guard members and 100 work camp inmates are helping on the levees. Authorities anticipate the river cresting in the area Thursday and Friday. The U.S. Small Business Administration thas extended a rural economic-development program to Kansas, Iowa, Nebraska and Missouri, reports the Springfield Business Journal. The initiative is intended to make it easier for smaller community banks and credit unions to use SBA loans products to finance small businesses. "Companies throughout America, especially rural America, rely on community banks to finance their growth, and rural small businesses often need strong relationship support, which small community banks are qualified to provide," said Jovita Carranza, SBA deputy administrator. "We are committed to expanding access to private capital for rural entrepreneurs by becoming a better partner for America's community banks." According to a news release from the SBA, the key features of the plan include: A shorter, simplified application for loans of of $350,000 or less; An expedited SBA loan processing time of 3-5 days for routine loans; Only limited, key financial documentation is required; An SBA guaranty of 85 percent is available for loans of $150,000 or less; 75 percent if the loan is larger; Loan applications may be faxed or e-mailed to SBA; A simplified loan eligibility questionnaire is provided to help small or occasional SBA lenders understand SBA’s eligibility criteria; and SBA provides specialized assistance to small/rural lenders on complex eligibility issues. Strange writes in a separate piece, "Much of the back and forth stemmed from a letter written by National Park Service environmental engineer Don Shepherd last week--after the public comment period on the permit ended--speculating that the plant could harm the George Washington National Forest and suggesting the consideration of different technology at the plant. But Rob Feagins, the DEQ air manager, pointed out repeatedly that federal authorities have given the nod for the plant, saying it complies with existing regulations." Controversy abounds over proposed construction of the $1.8 billion, 585-megawatt coal-fired power plant by Dominion Virginia Power, the state's largest electric company. The demand for the plant comes from "Northern Virginia's air conditioners, laptop computers and other electrical devices," David Fahrenthold writes for The Washington Post. "The utility has been met by strong opposition, however, fed by a region-wide hostility to new power projects and a national backlash against the greenhouse-gas emissions associated with coal. On Tuesday, people in a high school auditorium argued a question that would have seemed ridiculous to their grandparents: Should coal be burned for power in Virginia coalfields?" To read more, click here. "The debate touches core issues affecting all Virginians, including global warming, fossil fuels, air quality, mercury contamination, economic development, state energy needs, jobs and social justice," Scott Harper writes for The Virginian-Pilot of Norfolk. "Almost every politician and local official from the remote, financially depressed region endorses the project, expected to generate electricity for at least 50 years," Harper writes. 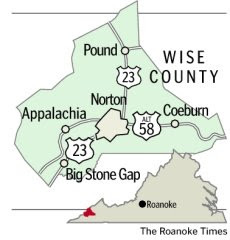 Dickenson County Board of Supervisors Chairman Donnie Rife "told the board it has the future of the entire region in its hands," Strange writes. "Coal is Southwest Virginia," Rife said. "Coal is Appalachia. There would be no way I could stand up here before you if I didn't think Dominion will be one of our best companies. I'm proud they're coming here to use our product." "The Wise County debate is among a number of fights over energy in the mid-Atlantic region, including disputes over power-transmission lines planned in parts of Maryland and Virginia," Fahrenthold writes. "In all the battles, power companies say the electricity is needed; o pponents say the environment costs are too high." 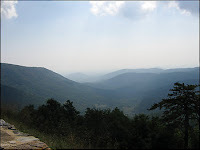 Environmentalists say the Dominion plant would intensify polution that, among other things, would decrease the state's air quality and visibility at Virginia's Shenandoah National Park (pictured in photo by Fahrenthold). "Activists also say the Dominion plant would spew toxic mercury that could end up in streams and the Chesapeake Bay," Fahrenthold writes. "They also say that it would drive up demand for descructive mountaintop-removal coal mines. Dominion officials have defended their proposal, saying they will use technologies that keep pollution at a minimum. On the issue of national parks, they say the plant's impacts would fall within federal guidelines." How can Barack Obama appeal to rural voters, especially those in Appalachia? 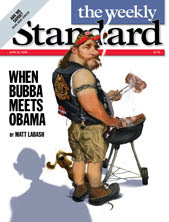 Matt Labash of The Weekly Standard tells how by spending some quality time with his fishing buddy, David "Mudcat" Saunders, who was the rural strategist for John Edwards' campaign. "Mudcat says race is no more a factor here than anywhere else," Labash writes from Saunders' stomping grounds near Roanoke. It's just a matter of fulfilling the traditional rural expectation of being asked for your vote -- in person, or at least with visits to your area. Obama made one stop in Kentucky and concentrated on Oregon, which had its primary the same day. "You read in all the local papers that Obama ain't comin' out here and getting your vote, cause he don't think he can win it," Saunders tells Labash. "Are you gonna vote for the sonofabitch? Hell no!" Labash writes that Obama needs to "give a version of the following," as iterated by Saunders: "I'm a black guy, and I promise you I didn't have a thing to do with it. If you're not going to vote for me since I'm black, then go to hell. I don't care. I don't want your vote. But what I'm going to do is this: My people are suffering. I've worked in south Chicago, and I've seen their problems. I've been out to rural America, and I've seen your problems, and they're a mirror image of each other." In other words, "The poor whites of Appalachia and inner-city blacks ... couldn't be more divorced culturally, [but] have many of the same problems, from crumbling infrastructure to poor schools to the need to leave home to find jobs," Labash writes. And at least one other thing. "Obama should set about wedding the two by visiting here and sending active surrogates, says Mudcat, adding that he'd need 'good rural surrogates, right-thinking people -- people who have faith. If they don't have faith, I don't f---in' want 'em. Faith in the power that can pull us all together." Labash analyzes the attitude this way: "Saunders and his friends take their guns and God straight, and don't require any chaser of frustration." U.S. coal producers are struggling to meet increasing demand because of an extensive permitting process, insufficient investment and a scarcity of skilled miners, which results in tight supplies and high prices, reports The Wall Street Journal. "The underlying industry-wide issues are compounded by severe floods in the Midwest, which have stranded barges full of coal and submerged railcars used to haul coal," Kris Maher writes. "It isn't clear what impact those interruptions will have on supplies and prices." Vic Svec, a senior vice president of St. Louis-based Peabody Energy Corp., said the floods will take several million tons of coal offline. Industry authorities have predicted U.S. demand for coal to surpass supply by 15 million tons this year, primarily because of increased exports and government restrictions. "Despite the strong margins that coal companies are seeing, the supply response has so far been limited," said Paul Forward, a coal analyst with the brokerage Stifel, Nicolaus & Co. "I think it's probably a couple of years worth of time where these markets stay tight." David Khani, director of research at FBR Capital Markets in Arlington, Va., estimated that up to 40 million tons of production is being delayed by environmental permitting and new safety regulations. "While 40 million tons doesn't seem significant given that the U.S. produced 1.15 billion tons of coal last year, even small shifts in supply can have a big impact on price," because so much production is locked up in multi-year contracts, Maher writes. Another contributing factor keeping the industry from taking full advantage of the demand for coal is its reluctance to buy new machinery and develop new mines when prices were lower. "Until these higher prices, the industry has not been investing," said Dan Roling, chief executive of Knoxville-based National Coal Corp.
"The supply constraints are most acute in Central Appalachia, which accounts for 25 percent of the coal mined in the U.S. but has a greater impact on market conditions because coal from the region generates more heat per ton than coal from other areas," Maher writes. "The spot price of Central Appalachian coal sold to both utilities and steelmakers has tripled in the past year, with "steam coal" going to utilities rising to as much as $140 a ton from $44 a ton, and metallurgical coal for steelmakers to $300 a ton, from $100 a ton. Coal production in the region declined 2.3 percent through early June compared with the same period last year," according to an analysis by Forward of U.S. Energy Information Administration data. "In general it's hard in the short run in our business to dramatically increase production," said Thoman Hoffman, a spokesman for Pittsburgh-based Consol Energy Inc., the nation's fifth-largest producer. "It's not like we have a bunch of idle production and we can just turn a key and out it flows like water through a pipe." Still, Consol expects a 10 percent increase in production this year, to 70 million tons, from its 16 mines in Appalachia and one in Utah. "In a letter dated June 17, Galbraith blamed fearmongers for the business's collapse and had this message for breeders who worked for him: 'Recently there has been more money going out of the bank than coming in, and there is nothing left. I have had to retain the services of a bankruptcy trustee to take over the affairs of the company. This means my hands are now ties and the trustee in responsible for everything.'" To read Zippay's entire story, including Galbraith's letter to breeders, click here. An increasing number of school districts nationwide are contemplating or have already converted to four-day school weeks, in response to rinsing fuel and utility costs. This could become a major way for schools to save money, especially in rural districts where busing costs are high, but there are disadvantages. The Courier-Journal reports that multiple school districts in Kentucky are considering four-day weeks. Pike County schools have established a committee to investigate the possibility. Webster County schools and Jenkins Independent Schools in Letcher County moved to four-day weeks a few years ago and extended the length of school days to conform with the number of required instructional hours. The "switch has brought about nothing but improvements to their systems," reports. the Kentucky Post (which survives as a Scripps TV Web site though the company has closed the newspaper of that name). "Just because the four-day system may work well in Jenkins and Webster, officials at the schools warn that they success may or may not translate to a large school system like Pike County," the state's largest in land area. Still, the four-day school week was discussed at great length this month during a State Board of Education meeting. "The board was very interested in the subject, and we decided that a future meeting, as soon as we can get them on the schedule, for districts to come up and talk to us" about four-day school weeks, Board Chairman Joe Brothers told Louisville's WLKY-TV. "It's an exciting idea that's time has come." Kentucky is not the only state with districts considering a one-day reduction in school weeks. The Town Talk of Alexandria, La., reports that the Evangeline Parish School Board is considering a return to four-day weeks: "The board tried the four-day schedule at several schools in the parish, but the superintendent at the time felt the system was not saving sufficient funds to justify the change, and the district went back to a five-day schedule." Jessica Bauer writes for the Log Cabin Democrat in Arkansas that "with the rising cost of gasoline, and the rising cost of everything that goes with it, school districts across the state are looking at ways to buckle down on spending," including a four-day week. For its 40 years of community leadership, especially on civil rights and reconciliation, The Neshoba Democrat, a weekly newspaper in Philadelphia, Miss., is this year’s winner of the Tom and Pat Gish Award for courage, integrity and tenacity in rural journalism from the Institute for Rural Journalism and Community Issues. The Institute established the award to honor the couple who have published The Mountain Eagle in Whitesburg, Ky., for more than 51 years. The Gishes were the first recipients of the award. This year's will be presented to former Democrat publisher Stanley Dearman, right, and current publisher Jim Prince on Friday, June 27, at the Mississippi Press Association’s President's Banquet at the Beau Rivage Resort in Biloxi. The centerpiece of the newspaper’s work in civil rights and community reconciliation was its effort to bring to justice all the killers of James Earl Chaney, Andrew Goodman and Michael Schwerner, civil-rights workers who were murdered in Neshoba County in July 1964. Though seven men allied with the Ku Klux Klan were convicted of federal conspiracy charges, none served more than six years, 11 others went free, and the case was never prosecuted by the State of Mississippi until Stanley Dearman, Jim Prince and others called and worked for action. Dearman said he first began to believe that his readers would support a fresh attempt at justice in the case when they supported his efforts to rein in bootleggers who ran wide open, preyed on the local Choctaw Tribe and at one point tried to lure him into an ambush. “It had a direct effect,” he said, on his better-known crusade. In 1988, the movie “Mississippi Burning” revived memories of the murders. On their 25th anniversary, in 1989, Dearman forced the issue by promoting a memorial service and publishing a lengthy interview with Carolyn Goodman, the mother of Andrew Goodman. It took up more than a full page of the newspaper. Jerry Mitchell of The (Jackson) Clarion-Ledger, whose reporting also pressured officials to seek indictments for these and other killings in the civil-rights struggle, said of Dearman, “He called on his community to prosecute the very killers who shared the sidewalks he did in downtown Philadelphia. People in town told him to leave it alone. They told him to forget it, but the truth is, Stanley Dearman never forgot. He will never be forgotten in Mississippi history because Stanley Dearman never forgot.” Mitchell nominated the Democrat for the Gish Award. David Goodman, the brother of Andrew Goodman, told Dearman in a letter, "You stood up to a lot of resistance to print the news even though it had economic consequences to your family's sole source of income and even through you putting yourself in physical harm's way. You are a brave man, amongst other special qualities, and a great patriot of our great society." As the 40th anniversary of the killings approached without such an accounting, Prince and Dearman helped organize the Philadelphia Coalition, which scheduled an observance and adopted the motto “Recognition, resolution, redemption: Uniting for Justice.” Prince was co-chairman of the coalition. He said he felt obliged, as the Democrat’s owner, to follow the example Dearman had set. The coalition published a tour guide to the local sites that were linked to the murder and other locations tied to the civil rights movement. Prince also pushed the issue in his newspaper. To mark the 40th anniversary of the murders, the Democrat republished some of its stories and pictures from 1964, which were often not friendly to civil-rights workers and their cause. The series was called “44 days in 1964,” the time between the killings and the discovery of the bodies. The series logo included pictures of the victims. On June 21, 2005 — exactly 41 years to the day after the three were abducted, killed and buried — a local jury convicted former Klan leader Edgar Ray Killen of three counts of manslaughter. Dearman, who had predicted that a loc al jury would convict, cried as he heard the news. The Virginia Department of Agriculture and Consumer Services is following the lead of some other states and launching a program to provide school cafeterias with locally grown fruits and vegetables. Farm-to-School "is a statewide program designed to use fresh Virginia Grown products in school cafeterias. This program supports local farms and offers fresh, more nutritious foods for school meals," the VDACS Web site says. According to a press release, the Farm-to-School program Web site "serves as a matchmaker for farmers and school food service directors. It brings them together in a common goal to attach the problem of childhood obesity and provide better nutrition through consumption of fresh produce." "The Farm-to-School program is about creating connections between growers, distributors and educational institutions," VDACS Commissioner Todd Haymore said. "Through these connections, we also can reach children and their parents. Farm-to-School also can play a constructive role in helping address the problem of childhood obesity, as few things are more helpful in that regard than adding more fresh fruits and vegetables to children's and families' diets. An added benefit is that using local produce in school menus supports the ag economy. This is a win-win situation for Virginia's children and for Virginia's farmers." What's the buzz? Cicadas! Fried by a newspaper! Journalism is usually serious business, but journalists can occasionally have fun on the job and entertain their readers. This was the approach taken recently by staff members at The Winchester Sun in Central Kentucky to report on this summer's 17-year cicada invasion of the region, including an editor who literally bit into her assignment. The front page of the June 17 Sun featured three photos above the fold of Community Editor Rachel Parsons' reactions to her first taste of the insect. Parsons, who had a disgusted look on her face, said the cicadas were crunchy, but "did not have much of a taste. I don't think I need to eat them again." Parsons wrote in a column, "When I decided to pursue a career in journalism, I envisioned myself doing lots of exciting things. I'd be fearless and track down the story, no matter what it took. Let me be the first to say, however, that not a single one of those visions involved me eating a bug, much less one that was battered and deep-fried. Turns out journalism is full of the unexpected." Parsons' column isn't online, but the Sun home page has a slide show of the cicada taste test. The University of Kentucky College of Medicine will introduce a program this fall designed to train medical students to work in rural communities. Similar programs are growing in popularity across the country. "Students in the Rural Physician Leadership Track will spend two years at the medical college in Lexington and two years at Morehead State University in Eastern Kentucky. In addition to the medical school curriculum, the students will learn other skills, like the business of setting up a rural practice," Sarah Vos writes for the Lexington Herald-Leader. The program will recruit up to 10 students in 2008 and 2009, reports bizjournals.com. It will increase class size at UK to around 113 this fall. UK hopes to open a second program at Murray State University in 2012 if funding becomes available. Dr. Jay Perman, the dean, told The Daily Independent of Ashland, "If we give (students) a rich clinical experience in the opportunities they'll have in a rural practice, they'll be more likely to return there." Mike James writes for the Independent that "Teachers and mentors will come largely from the rural medicine environment and will serve as role models." "Kentucky has fewer doctors per capita than the national average, according to an October report by the Kentucky Institute of Medicine," Vos writes. The state averages 213.5 doctors per 100,000 residents compared to the U.S. average of 267.9 per 100,000. Perman said the ratio is even worse in rural areas. About 43 percent of Kentucky residents are rural, but less than a quarter of the state's doctors practice in rural areas, Perman estimates. Kentucky's program is one of several designed to funnel doctors to rural areas. Fifteen third-year medical students from Touro University College of Osteopathic Medicine in Vallejo, Calif., "will spend a year in North Coast clinics, shadowing physicians and learning about the medical needs of rural communities," with hopes that students will return to service rural residents, writes Michelle Ma of The Daily Triplicate. Touro University, which is located in the Bay Area, focuses on rural health for its students. This year's clinical rotations are new for the university and will provide students opportunities to work at rural clinics. "If you can get a physician training up here [in a rural area], there's a good chance they'll stay in a rural area," public health officer for Del Norte County, Tom Martinelli, said. In 2005, the University of Colorado-Denver School of Medicine began a rural track that had 90 applicants this year and provides "hands-on training earlier than other medical students, and they spend a month each semester helping doctors in rural communities," reports Denver's 9News. Mark Deutchman, the program's director and an M.D., said only 10 percent of physicians practice in rural areas though 20 percent of Americans are rural. "A lot of time, through the four years spent at an academic health center, (the) interest in rural medicine kind of goes away, and we're trying to keep that spark alive," he told 9News. Jack Berry, a program volunteer who had a rural practice for many years, said, "If you can help people understand that really rural medicine is the place that's the most fun, even now, they're gonna stay with it." Other universities are providing financial support to medical students who may serve rural communities. Oklahoma State University recently established a new group, Medical Cowboys, to provide undergraduate medical students financial assistance. Dr. Barry Pollard, the creator of and group leader for OSU Medical Cowboys' board, said the program should have a positive influence on the state's rural population. "I also feel a long-range goal [of Medical Cowboys] is to provide medical care to rural Oklahoma," he told The Enid News and Eagle. "It is a reality that physicians that go back to rural Oklahoma originally are from rural Oklahoma. We hope to provide health care back in their smaller communities. I really think that the program will help rural Oklahoma health care." (See update below.) When Barack Obama and Hillary Clinton make their first post-primary joint appearance this Friday, at a site that has yet to be disclosed, they might be well advised to come to the heart of Central Appalachia, Charles Mahtesian and Amie Parnes write on Politico.com. "Appearing with Clinton in the heart of the anti-Obama belt — the section of Appalachia where Clinton racked up 70, 80 and in more than a few instances, 90 percent of the vote against Obama — would be a bold statement about his intention to address the vulnerabilities the primary season exposed in his candidacy," they write. "Mingo, like many of its neighboring counties across the border in Kentucky and nearby in Virginia, didn’t simply reject Obama. It had a visceral loathing of his candidacy — delivering just 8 percent of its vote to him, compared to Clinton’s 88 percent. Race clearly played a role in that result, so bringing the Obama-Clinton roadshow to Appalachia would be an important step toward bridging that racial gap, not to mention a sign that he is not writing off Kentucky and West Virginia just yet. The media coverage of such a politically daring and conciliatory stunt would be almost unimaginably fawning, though the out-of-the-way location would likely diminish the size of the media pack." The writers could have (and probably should have) noted that in April, John McCain visited Martin County, Ky., which borders Mingo County and is the home of Republican National Chairman Mike Duncan. For their arguments for the other locations, click here. For former Appalachian reporter Judy Jones Owens' take in the Daily Yonder on some of the political reporting by outsiders visiting the region, which is that they were, er, taken, click here. UPDATE, June 23: Obama and Clinton announced today that their first joint post-primary event will be in the battleground state of New Hampshire and the town of Unity, population 1,500, where each of them received 107 votes in the January primary. Very cute. The news has already prompted dozens of comments on John DiStaso's story in The Union Leader.